Also known as the tile or wafer. 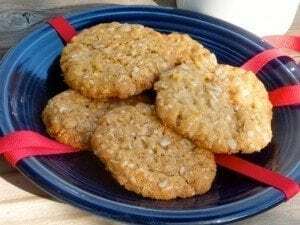 The popular Anzac biscuit is a traditional, eggless sweet biscuit. The following is an original recipe provided by Bob Lawson, an Anzac present at the Gallipoli landing. Anzac recipes cook nicely in the Sunflair Solar Cooker Oven. Grease biscuit tray and pre-heat oven to 180°C. Mix butter mixture and dry ingredients. Drop teaspoons of mixture onto tray, allowing room for spreading. before transferring to cooling racks. Note: Steam prevents UV rays from entering the cooking chamber. When baking without a lid, sometimes the inside cover may steam up. If this happens, open just enough to slide hand inside with a soft cloth and wipe clean. And/or unzip the zipper a little to release steam, like a tea kettle.